What is the Difference Between an Ed.S. and an Ed.D. Degree? Home/Frequently Asked Questions About Educational Leadership/What is the Difference Between an Ed.S. and an Ed.D. Degree? Traditionally, educational programs in the United States progress from the bachelor’s degree to the master’s degree to the doctoral degree. The Ed.D. is usually considered equivalent to a Ph.D. Some universities offer an Ed.D. and others offer a Ph.D. in education. A few universities (e.g. Harvard) are planning to phase out the Ed.D. and only offer a Ph.D. degree in education in the future. The doctoral degree, whether it is called a Ph.D. or an Ed.D., is focused on research. Students are expected to conduct research and contribute new knowledge to the field in the form of a dissertation or thesis before being granted a doctoral degree. Recipients of a doctoral degree can be found working as university faculty, senior-level educational leaders, and educational policymakers. For more information on the difference between a Ed.D and Ph.D, please see: What Is the Difference Between a Doctor of Education Leadership and an Education Leadership Ph.D. program? The Ed.S. degree is an education specialist degree. 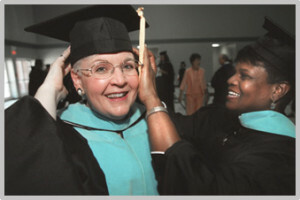 Individuals who have already completed a Master’s Degree in Education may choose to pursue an Ed.S. In general, the amount of additional coursework necessary for an Ed.S. degree after obtaining a master’s degree is about the same as that needed to get a second master’s degree. Some individuals who are granted the Ed.S. degree were originally seeking an Ed.D. and stopped short for some reason. Others seek the Ed.S. degree as a way to advance careers in education without having to write a dissertation. Ed.S. Degrees in Educational Leadership qualify individuals for superintendent and principal administrator positions. Principal positions generally only require a master’s degree, but many individuals seeking a principal position will obtain an Ed.S. School counselors in the K through 12 educational system are often required to hold an Ed.S. degree with a focus on school psychology. An Ed.S. in Special Education may be required for work as a special education director. Administrators at colleges and universities (deans, provosts) often need an Ed.S.degree. Individuals seeking program coordinator and department director positions may obtain an Ed.S. in order to appear more qualified than someone with only a master’s degree. Some community colleges may hire Ed.S. degree recipients as faculty. Ed.S. degrees are also useful in Adult Education programs, like GED and corporate training programs. The Ed.S. degree may also help individuals qualify as experts with state boards of education and the U.S. Department of Education. The difference between the Ed.S. and the Ed.D. degrees is similar in character to the difference between an associate degree and a bachelor’s degree. An associate degree is usually highly focused on developing qualifications for a particular type of job; an Ed.S. degree is highly focused on developing qualifications for a particular type of job. A bachelor’s degree takes longer to obtain than an associate degree and is focused more on obtaining a wide array of expertise in the field of study, similar to the Ed.D. degree. Of course both the Ed.S. and Ed.D. degrees are advanced, graduate degrees, unlike the associate or bachelor’s degrees. The main difference, though, between the Ed.S. and the Ed.D. degrees is the focus. The Ed.S. degree focuses on specific job qualifications while the Ed.D. focuses on research and broad knowledge. Either option is worthwhile for educators to consider but it is wise to look at your long term goals to determine the best degree for your professional aspirations.